The long-tailed broadbill (Psarisomus dalhousiae) belongs to the family of broadbills, Eurylaimidae. The long-tailed broadbill species are distributed in India, Nepal, Bhutan, Bangladesh, southern China and southeast Asia. These broadbill species are colored bright green with black cap and contrasting bright yellow face. These broadbills are polytypic species. The long-tailed broadbill (Psarisomus dalhousiae) is a distinctive colourful bird, measuring 20 to 25 cm in length and weighing 50 grams. These broadbill species are long-tailed and have bright green plumage. The adult long-tailed broadbills have a helmet-like black cap and a glossy blue patch on the crown. There are lengthened yellow or yellowish green patches on each side of the occiput. There is a smaller glossy light blue patch on the nape. The face and throat are bright yellow. There is a yellow throat band. There is a frill of whitish silky feathers which nearly surrounds the throat below the yellow band. The chin has a wash of pale yellowish green. The back and wings are deep grass green. The underparts are verditer green or bluish green. The primaries are black, having metallic blue margin at the base of the external web and white spot on the base of the inner web. In flight, the underwings of the long-tailed broadbill appear blackish brown with white patches on the base of the primary feathers. The tail is long, the undertail being black and graduated while the uppertail being blue or greenish blue. The bill of the broadbill is broad, strong and pale yellowish green with lighter edges. The irises are reddish brown. The eyering is yellowish. The forepart of the tarsi and toes are pea-green and the hinder side and the under parts are fleshy brown. The juveniles of these broadbill species are short-tailed, having green head and dull plumage. The long-tailed broadbills are noisy during breeding season. The call of the long-tailed broadbill is shrill, loud "pseeu..pseeu..pseeu" and "tseeay..tseeay..tseeay" sounds on a descending scale. They also make a sharp rasping "pseeup" sound. 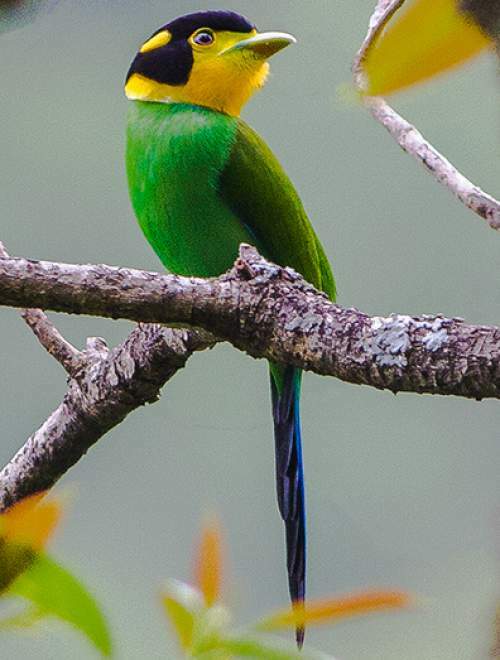 The long-tailed broadbill species are distributed in India, Nepal, Bhutan, Bangladesh (probably extinct), Myanmar, Thailand, Cambodia, Laos, Vietnam, China (Yunnan, Guizhou, Guangxi), Malaysia and Indonesia. In India, these long-tailed broadbill species are distributed in the states of Uttarakhand, Sikkim, West Bengal, Assam, Meghalaya, Arunachal Pradesh, Nagaland, Manipur and Mizoram. The long-tailed broadbill nominate subspecies P. d. dalhousiae is distributed in India, Nepal, Bhutan, Bangladesh, northern Myanmar, southern China, Thailand, Laos and central Vietnam. The subspecies P. d. borneensis is distributed in north Borneo (Malaysia and Indonesia). 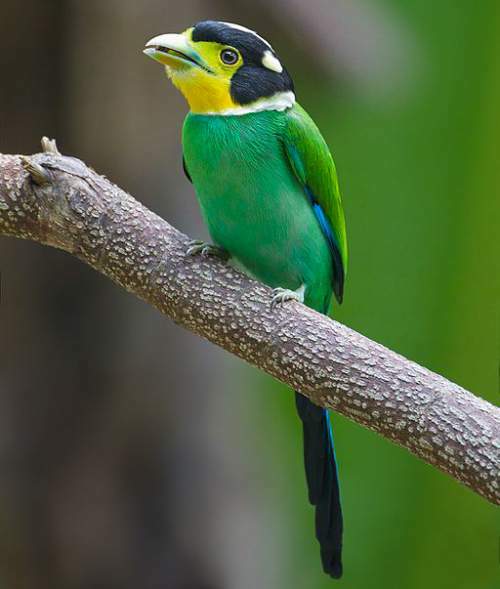 The long-tailed broadbill subspecies P. d. cyanicauda is distributed in southern Thailand and Cambodia. The subspecies P. d. divinus is distributed in southern Vietnam. The broadbill subspecies P. d. psittacinus is distributed in Peninsular Malaysia and Sumatra (Indonesia). These long-tailed broadbill species have medium forest dependence. These species normally occur in altitudes from 150 to 2500 meters. The artificial ecosystems of these long-tailed broadbill include cultivated land, pastureland and rural gardens. The natural ecosystems of these broadbill species include primary and secondary forests, tropical and subtropical moist lowland forests, tropical and subtropical moist montane forests, wetlands, rivers, freshwater lakes, streams and creeks. The diet of the long-tailed broadbill consists mainly of insects. Grasshoppers, crickets, locust, beetles, aphids, dipteran flies, bugs, moths and spiders are their primary food. Occasionally they may feed on small frogs, berries and fruits. The long-tailed broadbill usually glean the insects from tree branches, from the barks of trees, from foliage and from forest floor. They also catch flying insects on the wing. The breeding season of these long-tailed broadbill species is from March to August in Indian Subcontinent. The laying season is from April in Myanmar. The breeding pair of long-tailed broadbills build large, bulky pear-shaped nest. The nest is usually suspended from a branch of a tall slender tree, overhanging water. The nest has a small 1-2 inch circular aperture as entrance on the side of the structure. The broadbill nest is built with fine roots, creepers, mosses, dead leaves and other fibrous and stringy vegetable matter. The entrance is protected by a curtain of leaves. The nest is lined with grass, rootlets or small dry leaves. The typical broadbill clutch consists 5-6, elongate, oval, white eggs. Both the parents incubate the eggs and feed the young. The long-tailed broadbill species are non-migratory resident birds. In Himalayas, altitudinal movements have been observed. The birds in higher altitudes move to lower levels during winter. The global population size of the long-tailed broadbill (Psarisomus dalhousiae) has not been quantified. The overall population trend of these species is reported to be decreasing. Throughout its range this broadbill species is reported to be common to rare. The generation length is 4.2 years. Its distribution size is about 7,910,000 sq.km. Habitat degradation and fragmentation and trapping for the cagebird trade are the main threats that may endanger the survival of these broadbill species. 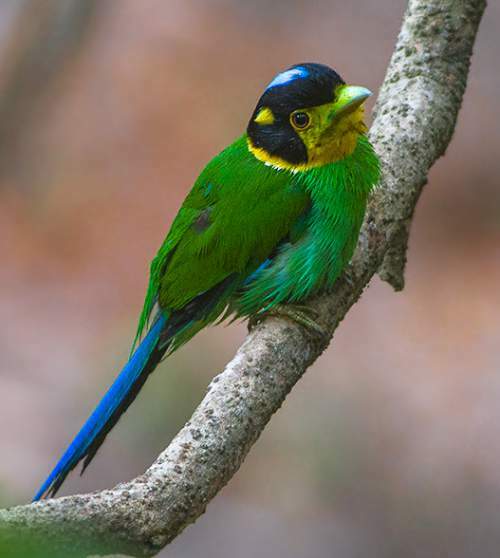 The long-tailed broadbill (Psarisomus dalhousiae) does not approach the thresholds for being Vulnerable, either under the range size criterion, or under the population trend criterion or under the population size criterion. The IUCN (International Union for Conservation of Nature) has categorized and evaluated the broadbill species and has listed it as of "Least Concern". The CITES (Convention on International Trade in Endangered Species of Wild Fauna and Flora) status is ‘Not Evaluated’ for long-tailed broadbill (Psarisomus dalhousiae). The five recognized subspecies of long-tailed broadbill (Psarisomus dalhousiae) are: P. d. dalhousiae (Jameson, 1835), P. d. borneensis E. J. O. Hartert, 1904, P. d. psittacinus (S. Müller, 1836), P. d. divinus Deignan, 1947 and P. d. cyanicauda Riley, 1935. Current topic in Birds of India: Long-tailed broadbill - Psarisomus dalhousiae.